After seeing just one too many of these videos, I decided to pre-order the Development kit directly from Oculus VR in January 2013. I simply had to try this new marvelous device and I just couldnâ€™t wait a whole year for the consumer version, or maybe even longer. Letâ€™s just make one thing clear; it lives up to the hype in every possible way, and then some. This thing is so completely different from anything you have ever experienced before, and it feels like a breath of fresh air in a gaming business that needs to renew itself badly. Before I got my Rift, I sat down in front of my monitor and looked at a game, now I find myself in a different reality inside the game. When I turn my head and look behind me the game is still there and I am actually looking over my virtual shoulder. It’s a strange feeling being inside the game, and itâ€™s incredibly addictive and super scary to experience this level of immersion at first hand. We are probably facing a revolution in gaming and gaming-like experiences. Oculus Rift is probably just the beginning. The question is whether you want the red or the blue pill, because once you’ve swallowed, there will be no going back. 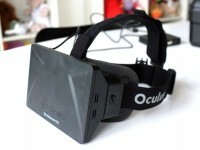 Note:Â This review is based on the developer version of the Oculus Rift. The final product is expected to have improvements / changes in several areas. The development kit comes in a big sturdy black plastic carrying case, the type often used to carry professional video and sound equipment in. Inside the box is a HMD (head mounted display) or a pair of Virtual Realty goggles if you like. 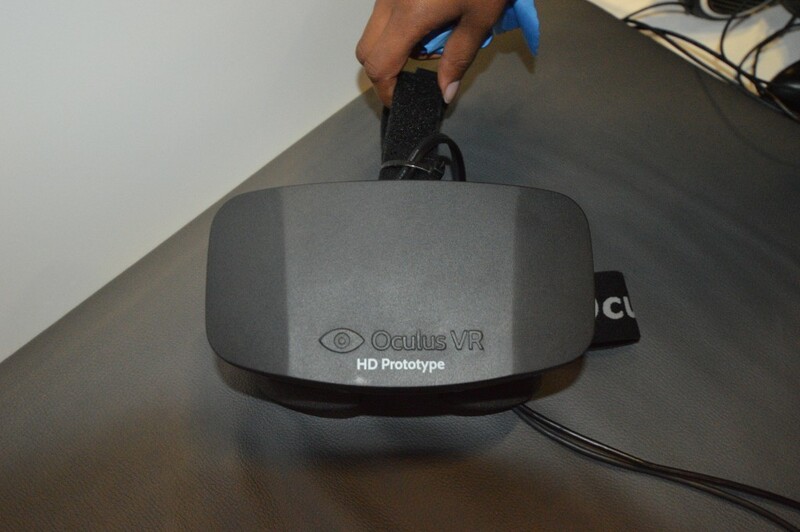 There is also a controller box that is connected to the non-detachable cable that comes from the HMD. The controller has buttons for brightness and contrast, as well as an on/off button. On the back of the box are standard HDMI, DVI, USB and a 5v DC power connector. You decide if you want to connect via HDMI or DVI. Both a HDMI and a DVI cables are supplied, as well as a DVI/HDMI adaptor. 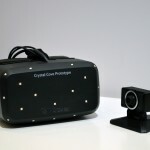 You will also find two sets of extra lenses, a power supply with both US/EU/UK plug, a USB cable, and a much needed, much appreciated polishing cloth with a Oculus VR logo. It all sits well-protected down in molded foam, and it all feel like really good quality, although it probably wonâ€™t win any design awards. In other words, it looks like what it is, a professional development kit. The Oculus Rift looks like a cross between a ski mask and a tablet – and in many ways it is just that. Itâ€™s a 7″ IPS display with a resolution of 1280×800 pixels, mounted on a kind of ski mask. Two powerful magnifying lenses are located in front of the screen, making the image look like itâ€™s wrapped around you, but at a comfortable distance from the eyes. There is also a PCB with some incredible fast accelerometers, gyroscopes and a magnetometer build inside the housing. Together with the ingenious software and the sensor fusion, it makes you feel like youâ€™re inside the game in full 3D in the same way as the reality you see around you. Thatâ€™s pretty amazing for a ski mask and some off-the-shelf electronics. Inside the Oculus Rift the accelerometers and gyroscopes are translating the direction you look in directly to the software, as well as the rotation of your head from side to side. This means that when you move your head and look around, the same happens in the virtual world – with virtually no noticeable delay. Unfortunately, the development kit cannot detect your position. So when you move your head forward to look at something closely or to look over the edge or something nothing really happens. Oculus VR promises that this feature will work in the consumer version, along with a higher resolution display and lower size and weight. The glasses are already surprisingly light (weighing just 379 grams) and I experienced no strain or discomfort of any kind wearing them for longer periods of time. The fit is also very good and I have only experienced one person whom they did not fit. You can adjust the distance from the lens to the eyes too. The closer they get to your eyes, the greater FOV (field of view). The FOV determine how much of your vision that is covered in the gaming world. The FOV is absolutely crucial in order to fool your brain and create immersion, and this is also where Oculus Rift really shines compared to just about everything else available to consumers. The mask has a wide, soft strap around going around your head, but also a strap over the head to stabilize and relieve. The strap over the head really makes a difference. There are three included sets of lenses in the box and you can switch between them according to your eyeglass prescription. The A-lenses are for normal 20/20 vision, B are for slight myopic vision and C are for moderate myopic vision. If you are farsighted or strong nearsighted, or you have astigmatism, you can use the A-lenses with your glasses instead, or better yet wear contacts. The glasses will reduce some of your FOV because the lenses has to be moved further away from your eyes to make room, so it’s a workaround, but with a reasonable result. I got the best results with B-lenses because Iâ€™m slightly nearsighted, although A-lenses for normal vision gave me slightly larger FOV with less sharpness as a tradeoff. The consumer model is supposed to have a diopter design, so you can adjust this yourself like with binoculars and SLR cameras. This will also make it better protected from dust getting inside the unit. Keeping dust out the unit is actually a problem when changing the lenses. The installation of the kit is surprisingly easy and I didnâ€™t really expect that of a development kit. Itâ€™s just plug and play and there nothing to install. It doesnâ€™t get any easier than that. If you have tried Nvidia 3D Vision or something like that, you know there is much hassle with drivers and tweaking every single game to work properly. Thatâ€™s not the case with Oculus Rift at all. When Oculus Rift is connected with DVI/HDMI and the USB cable, Windows 7 recognizes and installs. No drivers, no hassle. The same should be the case on a Mac, which I am yet to try myself. When launching a game with Rift support, it just works. Itâ€™s hard to believe it can be this easy. This is probably the consequence of making a system supported by the game or software, rather than support at driver level. Of course the game has to support Oculus Rift to work at all, but I feel this is the right way to do it. I would rather have 5 games working perfectly, than 50 games that kinda works. Although the development kit is intended for developers, there are already several things you can try out, even for an amateur like me. Valve was the first to announce official support in an AAA game with Team Fortress 2, as well as Half Life 2, including Episode 1 and 2. There are also very good mods for Minecraft and Doom III BFG and they work remarkably well and they are a recommended play for fans. There are also lots and lots of Oculus Rift demos made by both professional developers and amateurs, just waiting to be downloaded. Try visitingÂ www.theriftlist.comÂ for more demo and game support info. The list is long already and growing every day. 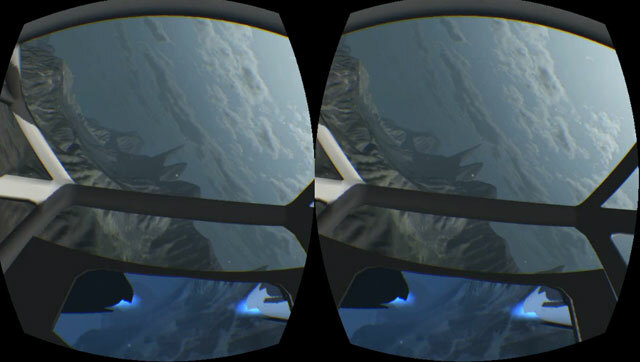 Some of the most popular tools for game development are already supported by Oculus Rift. 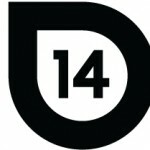 This includes Unity and UDK 3, as well as the upcoming and very impressive UDK 4 used by many developers for their upcoming next generation titles. That bodes well for the future, but it will be even more interesting to see how many AAA developers who will support the consumer model, once it has been launched. Itâ€™s also worth mentioning the two 3rd party drivers available to get existing games to work with the Rift. Vireio is an open source driver developed by the community and started by an Oculus VR employee before he got hired. The other option is vorpX and itâ€™s not free, but supports even more games than Vireio. Oculus VR doesnâ€™t recommend these drivers officially, as the experience is not the same as when a game is supported by the Oculus Rift natively. My experience is the same, but itâ€™s also nice to have more options at this early stage where only a few games are officially supported. It certainly provides the best experience to play the officially supported games, especially concerning the stereoscopic 3D, where the 3rd party drivers have no way of rendering true 3D. Without having access directly to the source code of the game, you cannot make a proper 3D perspective. 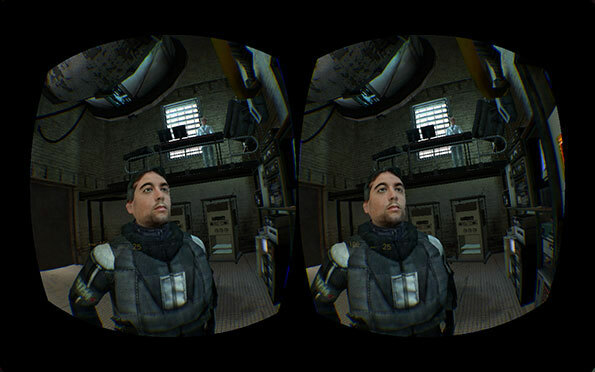 Let’s have a look at some of the available Oculus Rift games, demos and experiences. I must admit Iâ€™m a big fan of Half Life 2, so no wonder this was at the very top of my list of game to play with the Rift. It’s hard to explain how it is to start such a well-known game up for the first time with the Rift and then experience the arrival in the train cart with your very own eyes. Being there, looking around as if you have never experienced this before. It feels like the border between me and the game has vanished completely. When approached by guards with lifted batons, you just feel so intimidated and must obey their orders without question. You also get aware of your own intimate sphere and you really feel intimidated when you get too close to a character in the game, just like in real life. A few steps back and I felt alright again. Itâ€™s very strange and amazing to experience a game which has such a huge impact on your emotions and instincts in this way. The only thing that keeps the experience from being completely realistic is the resolution, thatâ€™s a bit too low. 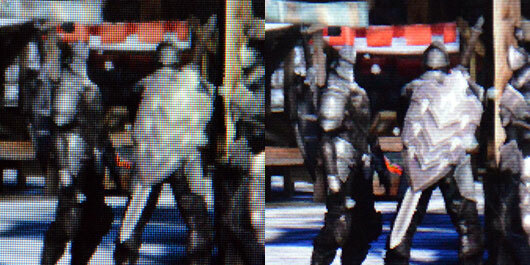 Itâ€™s especially noticeable with pixelated details and textures on things 15-20 feet away or more. 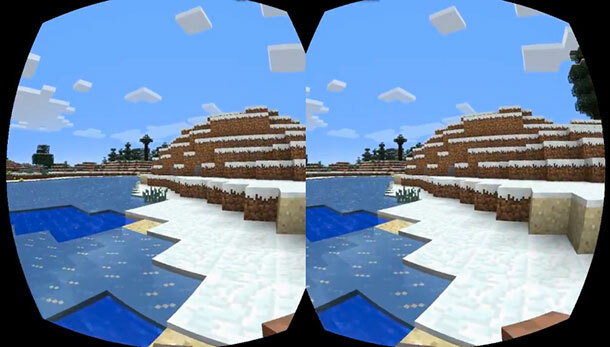 This also causes the otherwise gorgeous stereoscopic 3D graphics to lose some depth at longer distances. Stereoscopic 3D is truly breathtaking compared to anything else I have tried in the cinema, TV and on 3D monitors. It feels in no way intrusive or strenuous, but it just feels completely natural, just like in real life. If you get too close to an object, you react naturally by pulling your head back to avoid it. But more resolution is still needed to give more depth details further away. I never really liked 3D games and movies much, because my eyes got tired after 15 minutes use. With Oculus Rift I can play for 2-3 hours without any eyestrain or headache at all. Did you hear that Avatar? Itâ€™s time for us to meet again under more relaxing conditions! This is 3D as it should be, and itâ€™s also a fantastic way to get a great sense of both space and scale. You donâ€™t feel like youâ€™re looking at the screen in front of you, but rather that you are completely surrounded and immersed in the 3D world all around you. This is very strange considering the simple construction of Oculus Rift, but it just works. This is partly due to crosstalk being completely eliminated and because the two halves of the screen are completely synchronous. The only thing that keeps it from reaching utter perfection is the low resolution and the relative low contrast and saturation, all contributing to a visual impression thatâ€™s little flatter than it should be. This is a damn shame, but also a great promise of whatâ€™s to come in the consumer model. However, itâ€™s quite overwhelming to revisit everything again in correct scale. I think this is the first thing to dazzle people trying the Rift. The sense of scale is unlike anything you have seen on a screen before and just so must more like the actual world we live in, than a game really. Vehicles seem scary and dangerous driving by and itâ€™s really uncomfortable climbing high buildings, giving you a real sense of vertigo. People and things are the exact size we know from reality, adding to the overall realism of the game. Climbing narrow air ducts and being in small confined spaces, is suddenly getting me all claustrophobic and Iâ€™m not even claustrophobic in real life. This doesnâ€™t really happen in traditional gaming in front of a monitor, but Oculus Rift somehow fools the brain. You find yourself using much of your playtime walking around looking at the scenery and examining objects up close, appreciating all the nice details you probably wouldnâ€™t notice on a monitor or TV. The senses are working overtime and you really take the time sucking in all the details. The experience is totally different. The most popular demo right now for virgin Rifters is the â€˜Rift Roller Coasterâ€™. A roller coaster ride in a medieval themed world, built in UDK 3. After a slow, long and steep ride uphill, you find yourself going vertically down a huge drop and you physically feel your stomach turning while racing down the narrow rails. This demo didnâ€™t impress me much and I didnâ€™t feel the vertigo myself. But while demonstrating the Rift to family and friends, I found that some people have really strong reactions to this demo and some even pulls of the goggles before the big drop. It’s almost more fun to watch the reactions of others than trying yourself. Those afraid of heights and roller coasters are obviously more fun to watch. â€˜Planet 1â€™ throws you into the cockpit of a spaceship, hovering over a Mars-like planet. There are frequently meteor showers and a giant white orb on the surface. You cannot help looking over your shoulder every time a meteor zooming past blazingly fast. 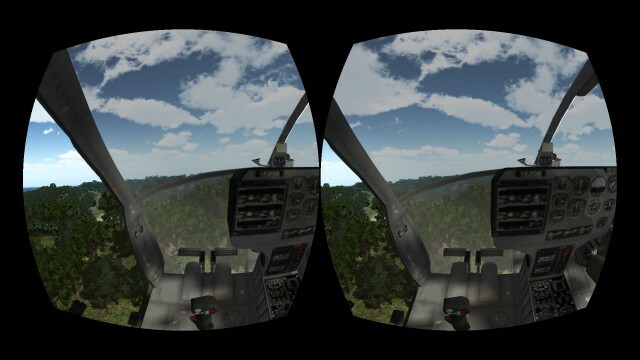 This type of cockpit-game just feels natural on Oculus Rift and since youâ€™re already sitting down in a chair, itâ€™s much easier to immerse yourself in the game. Itâ€™s probably safe to assume that flight simulators and racing simulators will get a revival with this immersive technology. We donâ€™t have to wait too long for this, because â€˜War Thunderâ€™ and â€˜iRacingâ€™ are supposedly getting official support. 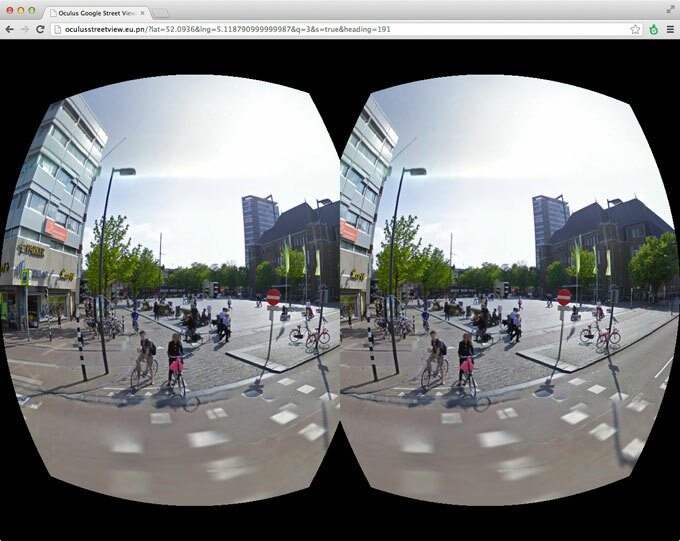 Using the plug-in vr.js for Chrome or Firefox, you can use Oculus Rift to travel around the world and experience known and unknown places in Google Street View. The head-tracking is working perfectly due to the plug-in, but experience mostly depends on how good the captured images from Google are. Most big cities around the world looks stunning, like New York and London. This really enhances the Street View experience exponentially and I found myself using almost two hours visiting places I have traveled and used to live. This plug-in is essential if you have a Rift and one of my favorite experiences. 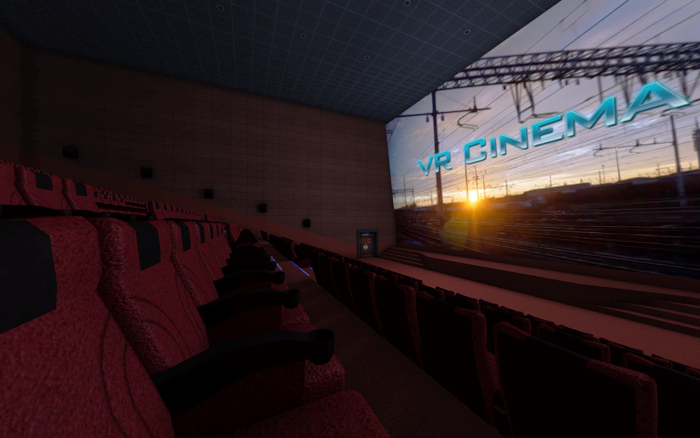 One of the more interesting mainstream applications currently for Oculus Rift, is a virtual cinema. You simply take the goggles on and immediately find yourself in the middle of a big movie theater with a huge silver screen. You can even walk around and sit down where ever you like. The software supports both 2D and 3D movies, and it’s just staggering close to the experience you get at the real theatre. A 3D movie looks even better than in a real cinema or at least more realistic and itâ€™s much more relaxing for your eyes too. Another developer from Norway is even working on a multiplayer cinema, or social hub, where you invite friends and family to sit down and enjoy a movie together. I really think this kind of application has huge potential for gamers and non-gamers alike. Canâ€™t wait to find out what kind of new social applications the future brings. When Oculus Rift adopts a higher-resolution display itâ€™s going to be a wonderful alternative to the cinema and to the home theater. This is definitely one of those things you never saw coming but one aspect of Oculus Rift, which seems so convincing that you almost cannot believe it until you’ve seen it yourself. What works in a regular game, do not necessarily work in virtual reality, and vice versa. Something like a static loading screen is absolutely jarring to look at and seems to be frozen to your retina. Itâ€™s especially jarring when youâ€™re unprepared and your world suddenly stands still, like itâ€™s the case with Half Life 2 loading screens. Cut scenes do not work particularly well either, or rather itâ€™s usually pretty bad when control is taken away from you. It simply feels like someone is abusing your brain. Taking a walk in a virtual world with nice scenery can be wonderfully relaxing. Just like itâ€™s nice to take a walk in reality to get a new perspective on things. 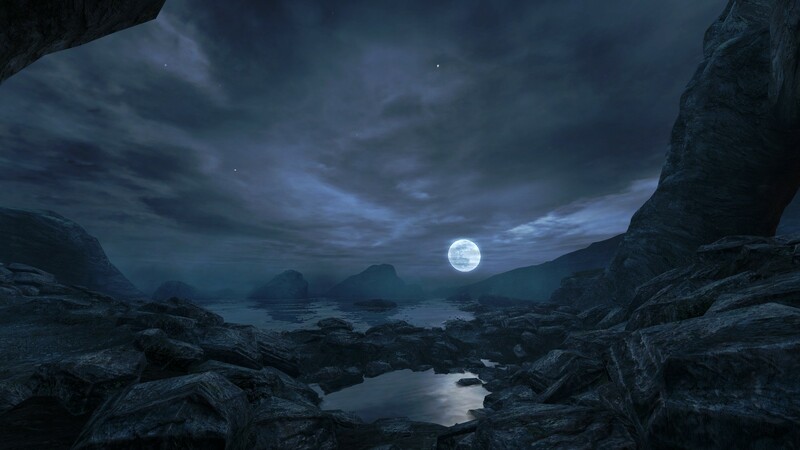 A game like â€˜Dear Estherâ€™ is a good example of nice scenery working quite well with Oculus Rift. Itâ€™s easy to imagine virtual tourism will be the next big thing and I canâ€™t wait to take a little vacation after a hard days work. Think about potential to aid people in hospitals and nursing homes and others that canâ€™t get around easily. This is a really nice thought. Mouse and keyboard isnâ€™t the ideal control method for VR. Itâ€™s a constant distraction, especially when you struggle to find the right key in blindness or loose the mouse. My Xbox 360 controller is better and the analog sticks are very well suited for controlling your pace and accelerating slowly, unlike the ON/OFF nature of a keyboard. But itâ€™s still not perfect though. 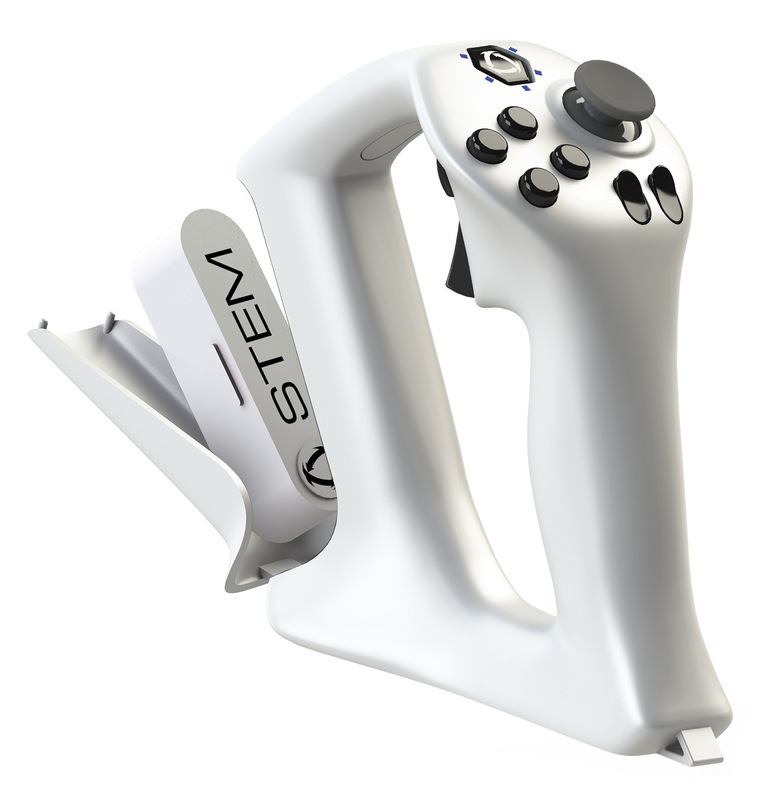 Thereâ€™s a need for something new that brings your body into the game, to reach new heights of immersion. 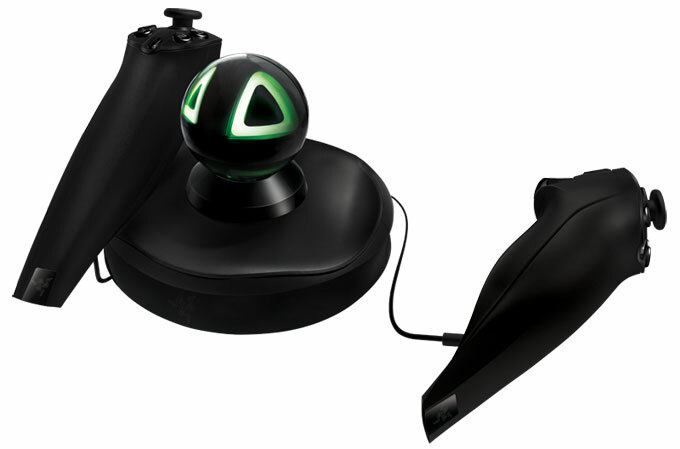 I donâ€™t know if itâ€™s something like Microsoft Kinect or maybe more similar to Playstation Move. Only time will tell. But I think there is a definite need for new types of immersive controls that arenâ€™t created for a 2-dimensional experience. There is also the problem of separating your movement from the head tracking and how exactly this should work. I like the default control method in Half Life 2 where you look around with head tracking, and control your weapon with the mouse. There is a dead zone in the middle of your view where the mouse only controls weapon aim, moving outside of that area causes your body to turn around instead. After a 10 or 15 minutes, this starts to feel pretty natural. One thing is for sure, itâ€™s really important that head and hand movement is separate. Razer Hydra is a device tracking your hands in all three axes, bringing your hands into the game. I tried the Hydra with â€˜Half Life VRâ€™, a Half Life 2 mod where you control your guns with 1:1 movement, just like in real life where you have to coordinate your hands and eyes to aim. It works extremely well in this mod and adds a whole new layer of fun and challenge to the game. The immersion is so much higher you see and move your own hands in the game. If developers take their time to integrate Razer Hydra in the games well enough, this could easily be the new preferred control method for first person games in VR. The only complaint I have about Razer Hydra is all the wires getting in the way. There is actually good news from Sixense, the company behinds the Hydra technology. They just announced their own successor to Razor Hydra called Sixense Wireless Motion Tracking System. This time they have ditched Razer to make their own wireless controllers. Iâ€™m very happy about that, because Razer often equals low build quality and a high price and I canâ€™t be the only one getting tired of red and blue LEDs. The new system pretty much improves on everything and even includes an extra detachable wireless motion tracker for positional tracking. Yes positional tracking! 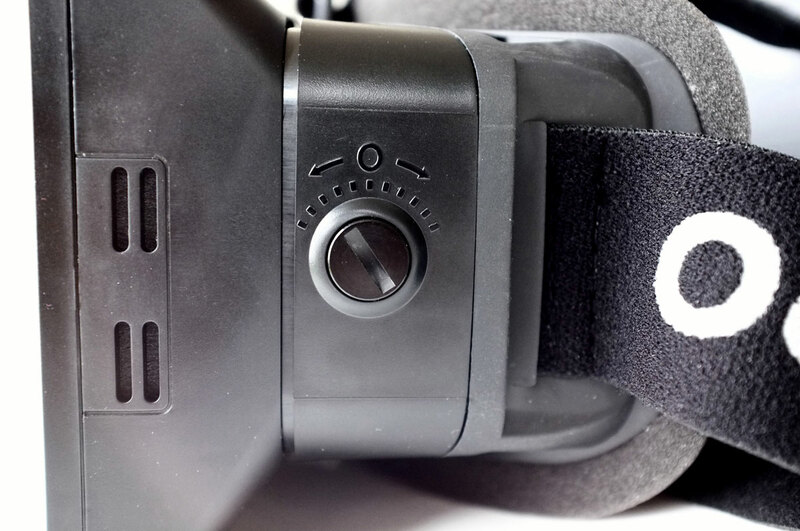 This is pretty much everything Oculus Rift needs for controls. Soon after trying the Rift for the first time youâ€™ll get aware of your own limitation in the world of VR. 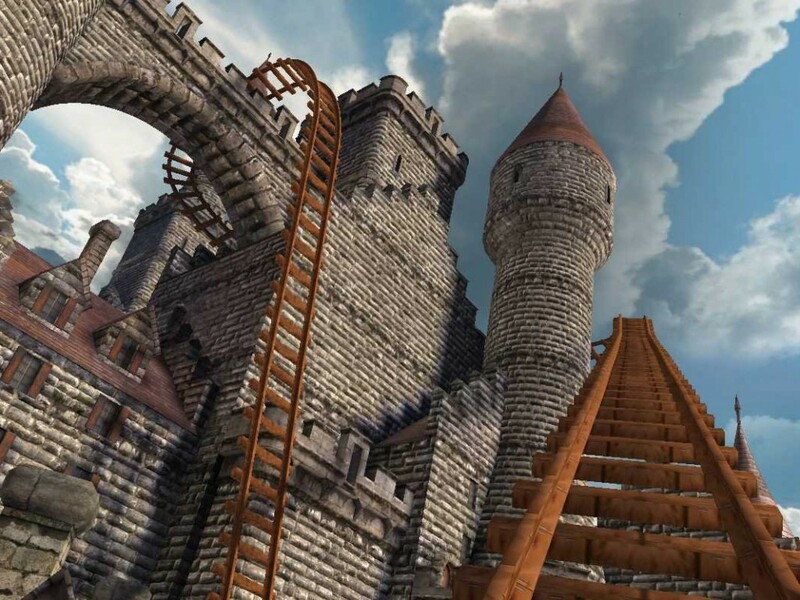 Some of the things that make you sick in real life also happen to cause motion sickness in games. I found that cockpit style games are the worst for me personally. Playing the demo â€˜Heli Hell 2â€™ gave me an uncanny sense of vertigo and made me motion sick in 2 minutes. Driving the beach buggy in Half Life 2 was also quite bad, but I got used to it after a few sessions. First person games donâ€™t make me sick at all, but it seems everyone is different in this regard. After getting sick I had to take a break for a few hours until I felt well enough to continue experimenting. After a few days this improved, and I was able to spend more time in the Rift. On the third day with the Rift I was able to play Half Life 2 for a few hours without any problems, and thatâ€™s a big improvement compared to 15 minutes the first day. I might be sensitive to motion sickness in VR, but I never got motion or sea sick before. I guess you have to try it yourself to determine how susceptible you are. If you already are susceptible to motion sickness, you will probably need some time to adjust to VR. Age also seem to make a difference, the older people are typical more sensitive to motion sickness. The good news is that anyone can get better with a little practice, some just need more time than others. Early reports indicate that this will also cure your motion sickness issues outside of VR. I hope thatâ€™s true. 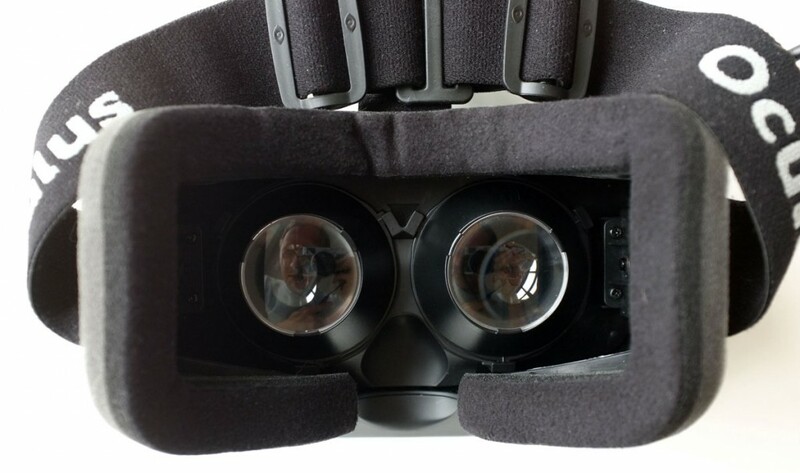 Oculus Rift is development kit and not a retail product made for consumers. This is emphasized by the very low resolution of 1280×800 split between two eyes, giving you a very low resolution of 640×800 pixels per eye. In fact the 7â€ 16:10 LCD even wastes pixels on black borders outside your vision, making the resolution even lower. This is because the Rift was originally designed for a 5.6â€ screen, but had to be changed to a 7â€ just before going into production. Stretching the low resolution over a huge field of view is making the pixels huge and you can even see the black lines between the pixels, also known as screen door effect. This can be described as looking through a fencing mask or real screen door. I had already heard about this issue before receiving my Rift and fortunately it was much less pronounced than expected. Contrast and color depth are in the low end by todayâ€™s standard and this is made even worse by always looking at it in total darkness inside the mask. This makes the image look a little dusty and lacking depth, which doesnâ€™t help the 3D effect either which is already struggling with objects far away, because of the low resolution. The screen is rumored to be the same as the one used in the Nexus 7. Even in spite of these screen issues it’s still a fantastic and unique experience in every possible way. Itâ€™s just important to keep your expectations about the screen on a reasonable level if you order the development kit. If you do, you wonâ€™t be disappointed. Motion blur is another problem; however itâ€™s not something that can be fixed right now, only made a little better by faster panels. The problem is a mix of two motion-blur effects. So if you fix your eyes on a static object in the virtual world, your head can still rotate while doing this. This allows motion blur across the entire screen while you essentially look at something thatâ€™s not moving. This problem doesnâ€™t exist on a regular monitor in this way, where only moving objects appear blurry. Essentially this makes the screen blurry most of the time playing, unless you donâ€™t move your head at all. I must admit I only noticed the problem with motion blur in the first minutes and forgot about it after that. This is a bigger problem for some, than others though. To me itâ€™s a minor problem. The most impressive thing about the Rift isnâ€™t even the hardware, but the great platform for virtual reality Oculus VR has created. 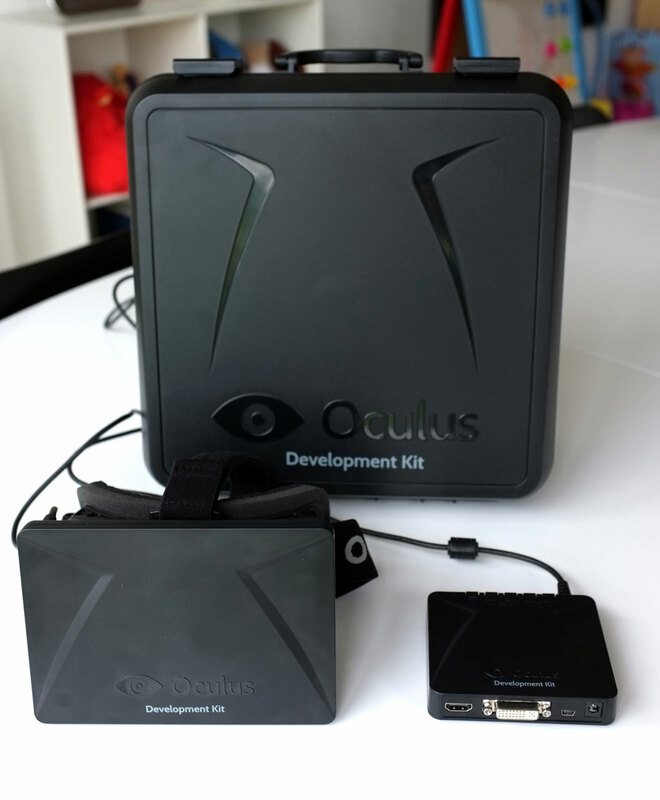 The SDK allows any developer to easily integrate Oculus Rift into their projects, with no or little knowledge about VR. And itâ€™s even easier for developers using Unity or UDK, where it’s as easy as drag and drop. Of course there is more to a good integration than this, but it shows that Oculus VR has the attention of developers already and this may very well be the key to succeeding. Oculus VR also managed to hire some of the most skilled people in the business and combined with support from developers like Valve, id Software, Dice and Epic, great things is bound to happen. Thatâ€™s why I think there is every reason to believe in a bright future for Oculus Rift and VR in general. If you are a developer or serious gaming enthusiast and would like to try out the Oculus Rift for yourself, you can order a development kit for $300 plus shipping. There is no tax if you live inside the EU, due to the European distribution center, handling the European customers. US and Canadian customers will get their Rift from the distribution center in California. Right now Oculus VR is having some problem with US customs, so there will be a slight delay on orders for US and Canada. European customers are unaffected. Be sure to check the status about this onwww.reddit.com/r/oculusÂ orÂ www.mtbs3d.com. I would wholeheartedly recommend everyone to order the development kit for $300, if the resolution was just a little higher. For me this is the only thing standing between Oculus Rift and true greatness and being a revolution in gaming. 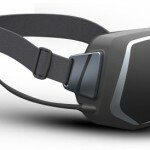 Fortunately, two weeks ago Oculus VR demonstrated an HD prototype of the Oculus Rift at the E3 show in Los Angeles. The difference is said to be like night and day, both in relation to the much higher resolution, but also a significantly better contrast and more color depth as a bonus. The so-called “screen door” effect is also virtually gone. Oculus VR promise that 1080p resolution is only a minimum for the consumer model and that they aim for even higher resolution. For the regular or casual gamer I would definitely recommend waiting for a HD version of the development kit or even wait for the final consumer model rumored to be launched mid/late 2014. If you have a chance to try out Oculus Rift somewhere, donâ€™t hesitate, itâ€™s well worth a drive! But for all developers, early adopters, Half Life 2 fans, VR or gadget enthusiasts out there, I think Oculus Rift development kit is well worth $300. There is plenty fun to be had, justifying the price. Go here to order:Â www.oculusvr.com. There is so much to look forward to with the consumer version of Oculus Rift and itâ€™s quite mind-boggling to think about where VR will be in a year or two.